I’m sure that all VAE members are enthusiastic about our hobby. In this, our 50th year, there may even be more enthusiasm than usual and this is great. 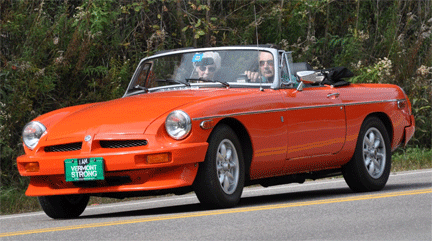 When we paid our dues and signed up we joined the Vermont Automobile Enthusiasts and here we are. Some of our members have really radiated that enthusiasm over their memberships and we are going to make some “Big E” awards. There are many many deserving people but these “Big E”s are going to some folks who have been at it awhile, have served in varied capacities, have inspired others, and have been responsible for milestones in our 50 year history. February’s “Enthusiast” Award goes to the Jones Family. This 3-generation family has been with us from the start and has always come through. 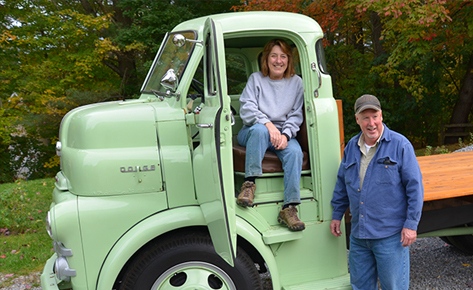 Walter and Hazel Jones of Morrisville had the interest, the cars, and they had Bob. Through their patience and generosity many younger members got off to a good start in our hobby and Bob speaks for himself… he always did, anywhere, anyplace, anytime. Bob’s Wheel Tracks articles are collectible, his car knowledge outstanding, and his contributions to the club unending. Twice President and always active, he taught us how to judge and how to get your own car “judge-able”. I came into ownership of my first car in 1950. It was a ’32 model and I was a ’38. I would have preferred something older, a roadster or touring car, but the ’32 Chevy coach was attractive, was older than I was and was only $15 dollars. In fairly rapid succession I then acquired a ’28 Chevy 4 door sedan, all apart but with good-looking tires, and a 1929 Viking Deluxe Brogham sport sedan. The latter was a big V8 that I never did get running very well. The Viking was $22 dollars and it was really quite a handsome car. This was a GM product that was placed about equal to the Oakland (same V8, a very flat “V” and not a really proven design as was the LaSalle and Cadillac) with an Oldsmobile chassis and a LaSalle’s good looks. I finally took a couple of the best tires off the Viking. (18″ on the ’32 Chevy. Strange about Chevy tires in those years: 1932 was the only year with 18″. 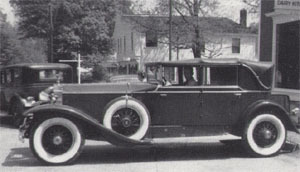 The ’28 parts sedan has 21″, ’29 models had 20″ and most of the ’30s models had 19″ along with ’31 and ’32 models being in the 18″ range. In ’33 we had 17″ and it wasn’t too long before that great old rag of a 16″ took us to post war General Motors. I sold the Viking to a guy in Manchester, Vermont for $100 dollars. I featured myself a tycoon until the check portion of his purchase ($50 dollars) bounced and I never did get that. Still, I reasoned, I had some tires and had doubled my money. This caught the attention of Honest John Hart Macy, a weekend car dealer in Swanton, Vermont. At age 14 I began to work for him on weekends when his “We Finance” used car lot was open. All that is another series of stories… but my point through all of this was to talk a little about first cars. OK, so it’s 1950 and I have this ’32 Chevy ready to join the family. My family had left the farm for an upstairs apartment in the middle of the city so there was no hiding it behind the barn. After some significant discussion, I rented a dirt floor garage with no electricity on Bank Street in St. Albans and stuffed the queen of the fleet in there. I won’t go into detail as to where we hid the ’28 Chevy in pieces or the Viking at this point. Here is some of the “first car” stuff I meant to share. The Chevy started hard and ran rough. The starting seemed electrical and I was somewhat overwhelmed so I thought that I would solve the other problem first. There were some high school kids around town, mostly Model A guys and some flat head Ford guys. I picked the kid with the oldest car, thinking him sensitive in this area and asked him, cap in hand, if he would take a quick look at my car hidden in its dark garage and give me advice on why it ran so rough. He agreed and came with some buddies, mostly to laugh I suspect, but after I finally got it started he listened and then pronounced, probably to impress his buddies, that the car needed an engine overhaul. Yep, the engine would have to be rebuilt. I should have realized that a Model A guy would probably say something like that. What did he know about the extraordinary “cast iron wonder” – the Chevy 6? Actually, what did I know about that “wonder”? Not much. So I rebuilt it. Someday maybe I can tell you of the wonder of a young boy opening up his first magical engine. With reverence and ignorance, through the winter, no heat, no electricity, dirt floor, flashlight and a set of really cheap New Britan tools from Dalton Auto Parts, I did it. In mid spring I borrowed a better battery and started it up. The Carter Carb, the first year down draft for Chevy, was easy to prime and the car started pretty quickly… and skipped to beat hell. After a couple of days in depression I was mentioning this problem to the counter guy at Dalton. Cal Baker was a Ford man and had worked at the Ford plant but he was also a pretty good guy. The conversation that I had with Cal changed my life. He asked me if the car was in time. I told him that my rebuild had not changed the timing gears. He said, no, no, how about the firing order… you know, the plug wires from the distributor cap. I must have looked blank and it was then that the change occurred. He said “1, 5, 3, 6, 2, 4. Find #1 cylinder and be sure the rotor is pointing… “. Well you know the rest. “1, 5, 3, 6, 2, 4” – my new mantra. I said it over and over again on the way to the garage. There, with my flashlight, the Chevy was “1, 5, 3, 6, 4, 2”. I switched two wires and fired it up. It still started slowly (that darn electrical thing) but it ran like a top! Did your first car give you hallowed experience… like actually peeking into a differential or really actually seeing the oil pump? Did it have a strong effect on you? Do you have stories about those early experiences? I hope you do. 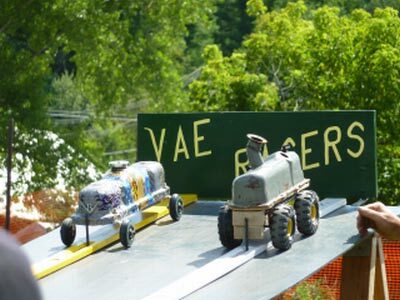 It confirms the fact that you are an Enthusiast… and even better, if you are reading this, a Vermont Automobile Enthusiast. It all started out with a search for some parts for a 1912 International Highwheeler. Somewhere through the grapevine, I heard about some Highwheeler parts in Washington State. I tracked them down and called their owner. He stated that they were not for sale but possibly could be had through a trade. I asked what he was looking for and he listed a series of cars that I did not have any parts for. One car the he mentioned was a One Cylinder Cadillac. Between 1903 and 1908, Cadillac cars only had one cylinder and therefore are called One Cylinder Cadillacs. I did not have any parts but started searching my memory banks for possible sources. I remembered that a gentleman in my hometown had a 1906 Cadillac. On my next trip to visit my parents I stopped in to see this gentleman. I explained that I was looking for Cadillac parts that I could buy to trade for Highwheeler parts. He indicated that he had an extra engine but was not sure if he wanted to sell it. I told him that if he ever decided to sell it, I would be interested. A couple of months passed. I was talking to my father on the phone and he said that the gentleman had called and said the engine was for sale. My father had no further details. I called the gentleman and asked for the details. He spent the first ten minutes telling me how rare the engine is and how valuable it was. I then asked the price. The response was $450. I said “sold” since I knew that the engine was worth much more that that. A couple of weeks later I went and picked it up. Not knowing anything about One Cylinder Cadillacs, I attempted to figure out what year it was. I found the serial number and it was 345. I did some research and found that Cadillac built about 2000 cars in 1903, their first year of production. Now this is where I got to use this expensive education of mine. I figured that if 2000 Cadillacs were built in 1903 and the serial number on the engine I had was 345, I could deduce that the engine came in a 1903 car. Isn’t higher education wonderful? I then made a call back to Washington State to attempt to make a trade. I described what I had and that I would be willing to make a trade. The response from the other end was “is that all you have of the car?”. The guy did not have a One Cylinder Cadillac and was not willing to trade unless I could provide more of a car. Now I am left holding the bag, or in this case the engine. I then started to talk to people who know of or had One Cylinder Cadillacs. I would tell them that I had a 1903 engine and inevitably the response would be “no you don’t “. I would ask why they did not believe it was a 1903 engine and I would be told that there is a very tight One Cylinder Cadillac following and that all the 1903 parts are known of. There is no way that I could have discovered an unknown 1903 engine. They would then ask about some of the dimensions and casting marks. Their next comment would be that it sure sounds like a 1903 engine. The grapevine then came into play again. The word got out that I had a 1903 Cadillac engine. Calls starting coming in. It seems that there are quite a few 1903 Cadillacs out here with newer engines in them. I think I got calls from about 10 people interested in buying the engine. Then offers started coming in. The highest offer for the engine, sight unseen, was $4000. In all cases I stated that it was not for sale. The more I talked to people, the more I thought I wanted a One Cylinder Cadillac. One of the people who called was a gentleman from Nebraska by the name of Homer. I had never heard of Homer and did not know anything about Homer. But, Homer would call me once a month to see what was happening with the 1903 Cadillac engine. I kept telling him that it was safe and sound, I did not need to do anything with it, it did not make any noise, I did not need to feed it, it was not bothering anyone and I was thinking about keeping it and building a car around it. Homer said I would never find enough parts to build a 1903 Cadillac. To which I replied that it did not need to be a 1903. I would be happy with any year One Cylinder Cadillac. That was my demise in keeping the engine. Homer then said he would see what he could do in trading material and call me back. A couple of weeks went by and Homer called. He said he had parts to a 1906 Cadillac that he would sell me if he could get the 1903 engine. He indicated that he could not trade outright since he would be supplying about ¾ of the 1906. The price was my engine plus $3500. I indicated that I did not have that kind of money and that I could not commit to the deal. I did know however that the parts that he was offering were worth much more than his asking price. But, since he was so hot on the engine, I figured I would see if I could get a better deal. Then the monthly calls from Homer resumed. I kept telling him that I was interested but needed a better deal. He would not budge on the price. Then one time he called, he asked what else I was working on and needed parts for. I told him what I had and needed. He indicated that he might be able to help me out on my 1907 Buick. He indicated that he would see what he could do and call me back. 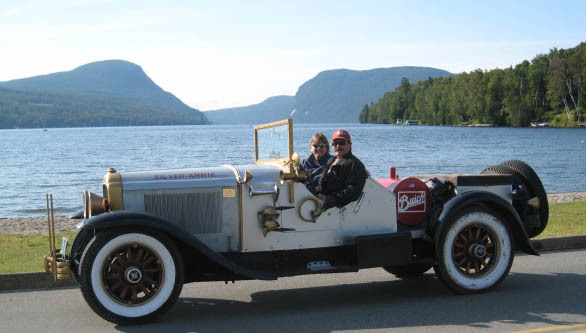 On the next call from Homer he asked if an engine for my 1907 Buick would make the deal. He said that he could not just include it and that the price would go up by $1500. I again said that I did not have that kind of money, hoping for a better deal. Since each year I make a trip to Wisconsin to visit my wife’s parents and attend the car show in Iola, Wisconsin, Homer and I agreed that I would put the engine in the truck and that I would stop by and see him. Now who is Homer? In my discussion with old car people, I started asking questions and getting information about Homer. Most people said that Homer is hard to deal with and that if you could deal with him, he always gets the better end of the deal. It turns out that Homer is an 80 something year old widower who has been collecting early cars and parts since he was a pup. He has a collection that is totally unbelievable. He has two restored One Cylinder Cadillacs, probably 10 other One Cylinder Cadillac engines and probably enough parts to put together about another 5 cars. He also has early Buick cars and parts, early Brush cars and parts, early Ford cars and parts (both Model T and before), 1909-10 Cadillac cars and parts and who knows what else. If it does not have gaslights, he is not interested. Electric lights came out around 1912. He has buildings and tractor-trailers loaded with cars and parts. For that summer’s trip, I had arranged to pick up parts for an IHC Highwheeler in Arkansas, Buick Parts in Wyoming and Buick parts in Iowa. By the time I got to Homer’s, I had a truck and trailer full of parts. We met for the first time when I pulled into the driveway but we were not strangers since we had many phone conversations. Homer looked the engine all over and stated that it was just as I had described it and that it was what he was looking for. We then went into his barn where he had laid out the 1906 Cadillac parts (3/4 of the car) and the 1907 Buick engine. The parts were in very good condition. I tried one last time to get a better deal. He was firm on his side of the deal. The money exchanged hands and the parts were transferred. We then took a tour of his collection, which took several hours. 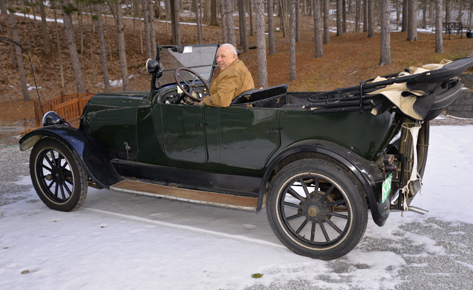 I was then on my way, the proud owner of a 1906 Cadillac and an engine for my 1907 Buick. By the time I got home I had traveled about 6000 miles in two weeks. And that is how a 1912 IHC Highwheeler begat a 1906 Cadillac. Homer turned out to be a very pleasant man. Since my first trip to make the trade, I have been back to see Homer every summer. I stay with him for a couple of days and we always find something to trade, but that is fodder for other stories. Homer has been very good to me and has always allowed me to borrow anything that I need to copy for anything that I may be working on. Our dealings have been fair and I look forward to each visit. Having taken the “Old Geezer” test in the last issue of Wheel Tracks and getting a perfect score, I started to think about some of the other things which happened awhile ago, leading up to the time when I first started to drive. 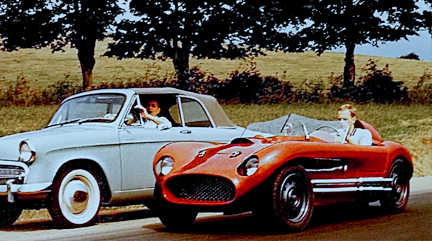 As an aside, it was a toss-up as to which car looked the same coming or going, the Studebaker or the Tucker. Figuring that they only made 50 Tuckers, Studebaker was the logical answer. I grew up in Morrisville, Vermont and near Fort Lauderdale, Florida. We have always maintained a home in southern Florida since some of the family are not too keen on the ice and snow. So my recollections cover both areas. I can recall the farmers bringing their milk to the creamery in Morrisville…there were two, The United Farmers and The New England Dairies… they merged to form The United Farmers of New England. The cars were always down at the rear, no doubt from the heavy loads. Generally model A Fords, but the Putnam family had a ’27 Model T. It was sort of a dirty maroon in color. The whole family came to town Saturday night to shop but never to go to the movies. It was the first Model T I have memory of. 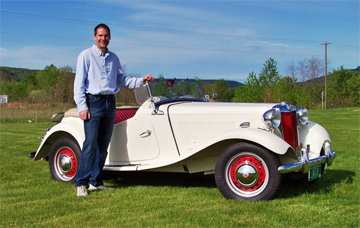 During World War II Bob Jones had a 1931 Chevrolet roadster. He paid $10 for it. He wasn’t old enough to have a license but his father would let him drive it on the dirt back roads. All the boys were green with envy, me included. As the war wore on, cars became hard to get and his father sold the car to a local man for $15-a 33% net profit. Bob was not happy seeing the car go. Mother had a new Ford convertible each year. She might put 1,000 miles on one in the course of a year. Father would turn it in before the new models came out and I know he said buying a new one each year was cheaper than keeping one two years. I remember the ’41 because it rode harder than all the other cars we ever had. Looking back I suspect the stiff seats had much to do with the hard ride. Down in Florida there was a pest control outfit named Truly Nolan. They had a bunch of cars, all registered, all painted a gruesome green with TRULY NOLAN lettered on the front doors. Cheap advertising I guess. The cars all ran for they were moved about from parking space to parking space. One, which I particularly recall, was a 60″ Ford Model T. These cars were made to fit in the ruts of the wagons, which had 60″ spacing between the wheels. While in the seventh grade, Bob Jones and I built our own car that we drove to school. Eventually the State Troopers threw us off the road, but for a brief while, we rode to school. It had a one cylinder washing-machine engine. At about this time I got my first license. In Florida you could get a license at age 14 with parental consent. I recall some downright begging to get Father to sign for me, but sign he did. It was legal in Vermont and I did use the family car now and again. The restrictions were quite detailed and I obeyed them, fully knowing that the punishment for breaking them would be severe (and just). My parents both expected us to obey the rules. In 1953 Father allowed me to buy a new car. 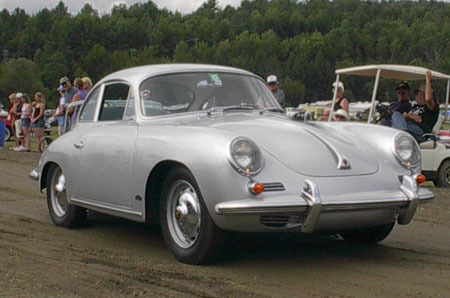 I really wanted a Jaguar XK120MC coupe, second choice a Porsche 1500S coupe. 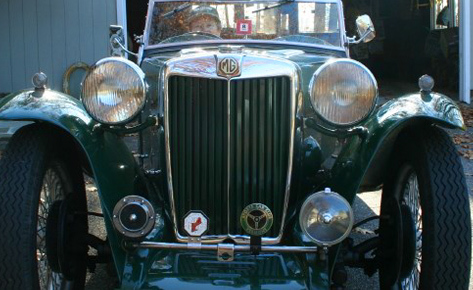 I got an MG TD… top speed not quite 80 mph. My roommate got a 1953 Studebaker Starlight coupe, modified by Bill Frick with a Cadillac engine. They were known as Studellacs and they could really tear down the road. They also could lay down a fearsome strip of rubber. But wonder of wonders, neither my roommate nor I ever got as much as a parking ticket with that car. The back seat was useless for dating since there was a fixed armrest right in the middle. State laws were somewhat different then. For example, Massachusetts’ law said that one could not involve more than two states in operating a car. You could not drive an Alabama registered car in Massachusetts with a Vermont license. So being the wise boys we were then, we all got Massachusetts licenses. I kept mine until three or four years ago when I stopped renewing it. There was no point in having two licenses since the law had changed. Perhaps now you can understand how I aced the Old Geezer test?